painting by California artist Jackie Jacobson transformed into a beautiful ceramic tile coaster. Extraordinary and intense. 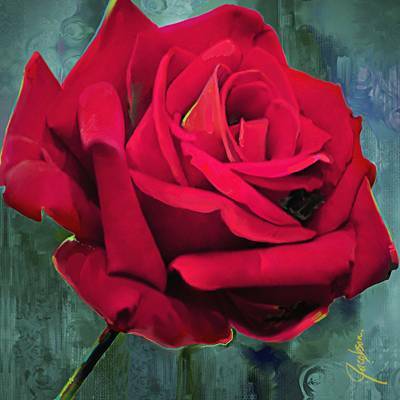 Rose Red painting is part of the series that were painted on top of a heavily textured background. More painterly in style, this Rose flower painting shows the many painting styles used by Jacobson. Inkjet sublimation is the process used to decorate the ceramic tile with unique artwork by Jackie Jacobson. When a tile is decorated using the sublimation process the image is transferred into the polymer coating and actually becomes a part of it.